The most recognizably 2015 element of the 2015 edition of Vacation comes early in the film: a shot of Debbie (Christina Applegate), stone-faced and mirthless as she comments on an Instagram post with an enthusiastic and exclamation-heavy “LOL!” For a moment, the movie taps into the playful sense of suburban ennui that powered the 1983 original, in which Clark Griswold (Chevy Chase) insisted that driving his family cross-country to the theme park Walley World would bring them all closer together. Thirtysomething years later, Clark’s son Rusty (Ed Helms, the fifth actor in five films to play the part) has a family of his own and, having apparently misinterpreted the original Vacation, believes the same type of trip will perform the same type of magic. As Rusty hastily throws together this idea for a new vacation, writer-director team John Francis Daley and Jonathan M. Goldstein throw together some hasty jokes about a new Vacation, giving Helms and Applegate dialogue about the degree to which this trip will resemble the previous one, and whether doing it over will result in disappointment. “The original vacation had a boy and a girl; this one will have two boys,” Rusty points out, referring to the superficial difference between his sons James (Skyler Gisondo) and Kevin (Steele Stebbins) and himself and his sister Audrey (played as an adult by Leslie Mann). It’s an amusing line in the moment. This fleeting bit of cleverness also manages to casually sell out any sense that this movie might be a continuation rather than a retread with a few tweaks, while announcing one of those tweaks will be a Jurassic World-style substitution ensuring that the newer film has even more male characters (a strange idea of novelty, to say the least). And so the Vacation cycle begins anew, in one of those sequels that also functions as an unnecessarily reverent remake. Once again, wacky vacation photos appear on-screen during the opening credits to the strains of Lindsey Buckingham’s “Holiday Road”; once again, there are comical problems with the family car; and once again, the movie proceeds as a series of comic vignettes chronicling the family’s various mishaps. The newer version offers some semi-clever flips: Instead of visiting much poorer relatives, the Griswolds make a pit-stop to see the much-richer Audrey and her strapping husband played by Chris Hemsworth, and instead of Clark lusting after a mystery woman played by Christie Brinkley, son James gets a less-sour crush on her teenage equivalent. Some of these episodes are funny, while plenty more inspire indifferent half-chuckles and shrugs—and to be fair, the original Vacation, despite its now-vaunted Harold Ramis pedigree, is just as slapdash in its construction. If anything, some of the newer film’s travelogue skits feel a little more conceptually substantial than the sometimes-wan blackout style of the original; there’s a particularly inspired bit of escalating silliness about jurisdictional conflicts at the Four Corners monument, and the Griswolds’ Albanian rental car provides some funny running gags. Even Helms, whose puppyish neediness can be trying, finds a clearer persona for Rusty (optimistic and open-minded to a clueless fault) than Chevy Chase did for Clark, who often felt detached from his on-screen family (he appears here briefly in more avuncular form). It wouldn’t be impossible, then, to match or even improve upon the 1983 Vacation. Yet the 2015 model still can’t manage it, in large part because whenever Daley and Goldstein have the opportunity to make any biting observations or mount sustained original gags, they floor it in the opposite direction. The original film at least contrasted Reagan-era dysfunction with one father’s picturesque and often-ridiculous ideal of an all-American road trip. The new one hints at modern complications, with Debbie’s miserably dutiful social-media experience and James’ very millennial sensitivity, but otherwise ignores its own set-ups. Rusty works as a pilot for a budget airline, which is portrayed as an obstacle not because, say, the Griswolds’ John Hughes-style palace in suburban Chicago stretches the often-low salary of a commercial pilot, but because he doesn’t get as much respect as pilots for those fancy name-brand airlines. Later, when the family visits Audrey, they discuss beforehand how her husband (Hemsworth) leans further right than they do. Instead of then tweaking either his conservative values or the Griswolds’ good-liberal sense of decorum, the movie offers a single running gag about his refusal to let his wife work and leaves it at that, seemingly afraid of offending anyone (at least until a non-joking late-movie dismissal of Audrey’s entire marriage, indicative of the movie’s willingness to toss aside its female characters to help the men self-actualize). 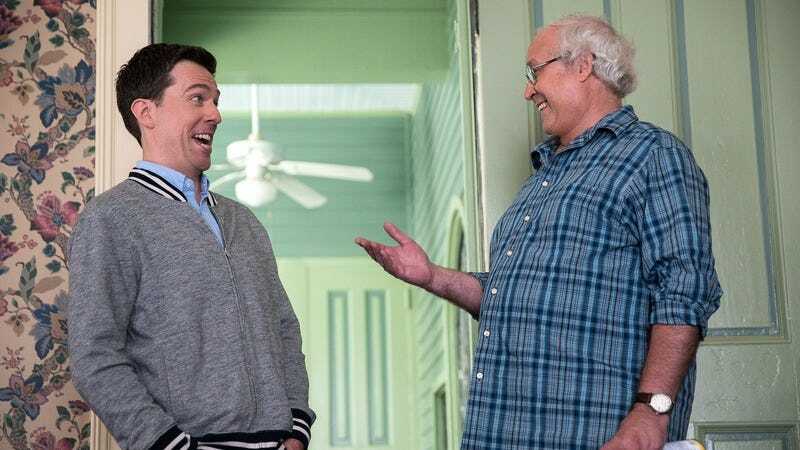 All of this might matter less if Vacation had more and bigger laughs, but Daley and Goldstein, directing their first feature after a series of screenwriting jobs, evoke the intermittent sloppiness of so many comedies from the ’80s and beyond. They do a nice job of locking their camera to the dashboard in one shot featuring a looming truck, but can’t exercise the same discipline for a sequence that finds Debbie running through a sorority-made obstacle course, and the different angles kill the slapstick momentum. Throughout, they augment pratfalls and gross-out gags with bad CG and augment verbal jokes with lazy contradictory muttering. Their take on Vacation isn’t laughless, but it’s not really a take either. It’s just a middling cover of a pretty good old song, adrift in the present day.